The Phantoms had one of the famous “3-in-3” last weekend, and managed to lose all three games–and gather zero standings points in the process. The games weren’t horribly played, but they’re having some trouble getting pucks in the net. Keep reading for my proposed solutions. They are getting some quality chances, and to be fair, it was three tough teams: Wilkes Barre, the top team in the league, Albany, who always plays us really tough–tough to score against that defense–and Binghamton, the worst team in the league who just somehow has our number. It wasn’t good; but I can’t say I’m totally surprised by the outcome. I also think it’s fixable. Yes I was happy with the 8-point road trip, but I did caution about playoffs. One bad weekend and now we’re further behind. Let’s ride the old cliche and take one game at a time and (hopefully) two points at a time until we’re back in this thing. I’m not saying or typing anything that rhymes with “alder cup” until we’re in a better spot. Our record is 17-19-2-1. Our home record is 7-11-1-0 (second worst in the entire AHL) while our road record is a more respectable 10-8-1-1–good enough for sixth overall in the 30-team league! It appears our horrible home record is dragging us down. We’ve just crossed the half-way threshold in the season. For reference, tonight’s opponent, the Hershey Bears, are in 5th place overall in the Eastern Conference, as of this writing. However, the Phantoms have played the Bears well this season–both home and away. The Phantoms are 5-2 overall versus the Bears, and 3-1 at the PPL Center. The three wins versus the Bears represent 38% of our entire home win total! Attendance: The attendance standings now have us fourth–despite the recent sellouts–behind the usual Hershey and San Diego. Lake Erie has now passed us; however, with the size of their arena all they need is a couple big games to climb the “average attendance” standings pretty quickly. Still, averaging 8,043 per night this deep in the season, in our second year, is pretty darn good. Christian Marti, the big Swiss defender, is back from Reading. He saw his first game action last weekend in Baseballtown, and is back with the Phantoms currently–and healthy. Look for him to get some ice time this weekend. Evan Rankin was released from his “PTO” contract, and headed back to ECHL in Toledo, per reports. Blog-favorite Jesper Pettersson, the “diminutive defenseman” was sent to Reading yesterday–the Phantoms were over-loaded d-men, and he should provide some nice blue line support for them. I thought he looked like one of the best players on the ice when we saw him play in Reading in November. There’s still a “veteran crunch” currently; we have too many veteran players. This is discussed further, below. Reading also had a “3/3” last weekend. They lost the first two to Toledo before defeating South Carolina. They’re on the road this weekend at Elmira Friday and Adirondack on Sunday. The team remains in fourth place in a 5-team division. They’ve suffered players coming and going of late–and not just because of the Phantoms. Guys like Cam Reid and Robbie Czarnik have been signed by AHL teams. Hopefully, with the Phantoms getting healthier, we can send some guys down to get more ice time and to help them stack some wins of their own. Hershey also had three games last weekend: They lost at Rochester and Syracuse before returning home to defeat Utica. This weekend, Hershey starts here in Allentown before returning home for back-to-back games versus Springfield. Hershey has had a couple roster moves since we last saw them–and they’ve been up and down a bit this season. Look for a Hershey team report following this post, if it becomes available. Tickets and Parking: Pre-purchase pass for the Arena/Linden deck via the PPL Center website–if available. Otherwise use the Parking Authority facilities. Meters need to be fed until 10PM. If you’re uptown early for dinner, have your parking validated or reimbursed at participating restaurants and shops–get a receipt. Limited seats remain for this game, although it hasn’t gone ‘SRO’ as of this writing–it probably will. I recommend securing your tickets before driving downtown and paying for parking. Printable Rosters: Print pages 11 and 12 of the Media Kit. Broadcast Information: Video via Service Electric TV-2 and AHL-Live (pay). Audio via AM-1470, Phantomshockey.com, IHeartRadio on Mobile and FM 89.9 in the arena (for “real time”). Pregame: TV Pregame show is live from Chickie’s and Pete’s at 6:30PM on TV-2. Radio pregame at 6:15 or so on AM-1470 to listen on your way downtown. Meal: We did post-game meal last Sunday, heading to BrewWorks because Kram3 wanted ice cream and I needed something good to eat. He had an ice cream sampler–all home made–with the feature being Strawberry-Balsamic-Black Pepper chef’s special. It was outstanding–he ate it all but I was able to manage a sample. My burger was very good as well. Our server handled our special requests with aplomb. Tonight’s plans are undetermined as of this writing. What I’m saying is, it all depends on DiPro. ROAR is the current points leader. Promotion: It’s T-Shirt night!–as you could see from above. 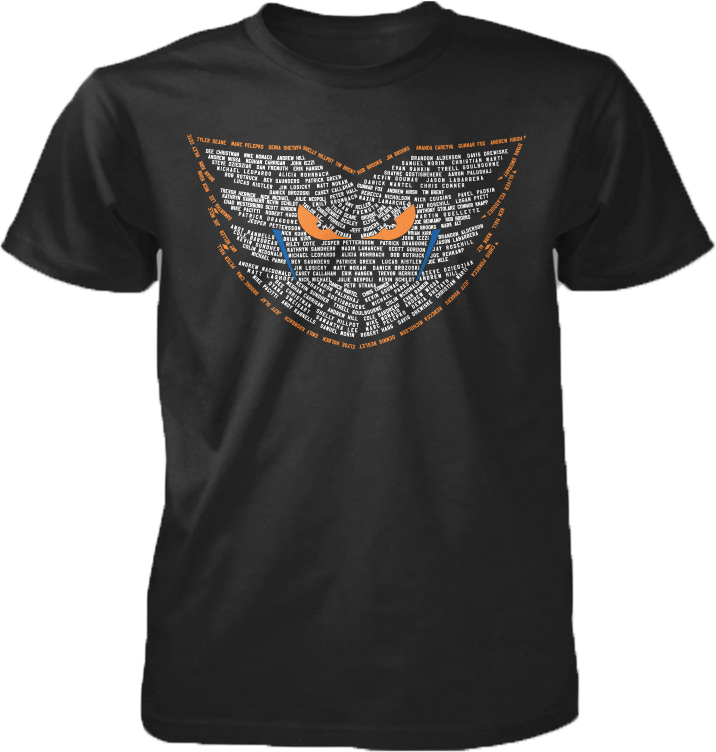 The black shirt includes names of everyone in the Phantoms organization. There should be plenty of them, but they’re not unlimited. Plus, you’ll still want to get to the arena on time to assure the proper size: last giveaway they had several choices there at the Tim Horton’s Gate. I’d recommend using one of the bigger entrances, too, rather than the restaurant ones, in order to improve your size choice odds. Personally, I’m hoping for XL. Season Ticket Holders: Remember to pick up your STH gift (pint glasses) and update your billing information for next season, with the folks out in the main lobby by Tim Horton’s. 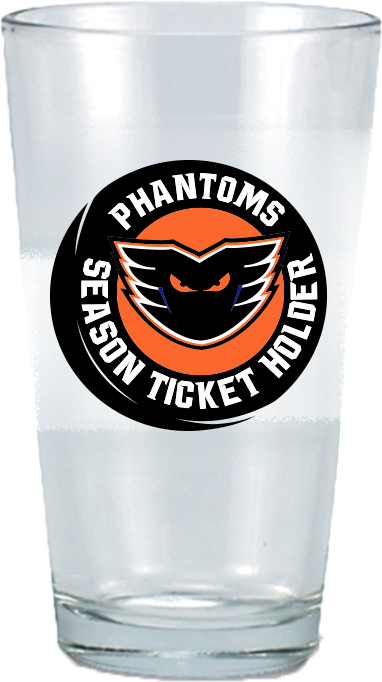 Phantoms Season Ticket Holder Carnival–for those who hold Season Tickets for NEXT season, will be Sunday, March 6th, I believe. Watch to see which veterans get scratched: With everyone healthy, three–count ’em 3–veterans will need to sit in the press box for tonight’s game. Jay Rosehill has been a fixture in that group, and Matt Lashoff quite a bit as well, although injuries have been a factor for him. The other may need to come from the offensive side–perhaps Gagne or Conner? It’s great to have veterans, but this is going to be a challenge for Coach Gordon for now–finding ice time for all these guys. It should, however, provide some depth for 3/3 weekends such as this one, but continuity might suffer. It’s something to watch, for sure. Watch how much time it takes to get a shot off. I know it’s kind of ridiculous for me to sit 20 rows from the ice and scream “SHOOT!” –and I’m all for passing to set up an opening and a higher percentage shot. What I’m observing is that despite a series of good passes it still takes a second or four for the shooter to get the shot off. By that time, the defense has shifted and the goalie is in position. Yes, a goon in front can be helpful–but really, use the puck movement to create the opening and then get a shot on net before you eat a sandwich. Watch rebounds. Now, the goalie we see tonight from Hershey will likely be much better than the third-string netminder we played against on Sunday. However, if there are juicy rebounds laying about in the crease or the low slot–somebody’s gotta be there. Crash the net and follow your shots fellas. Watch out Hershey if it gets to the shootout: They’ve lost 5 of those already this season. Watch Sam Gagner, #89. If he’s active, and not yet recalled to the Flyers: I think he’s getting his skates back under him and is looking better and better all the time. I agree with Hextall: Gagner’s an NHL player and for now we’re lucky to have him. He’s been fun to watch of late, and I hope to see him get a couple goals tonight. Watch #24 Straka. We’ve made a lot about his All Star snub around here–maybe too much to try to compensate? Not enough? No matter. If I’m him, I play with a chip on my shoulder–prove the doubters wrong and get the top goal-scoring spot back. Then get called up or at least win the league goal title. Have the last laugh. Let’s see how he responds. We’re right back at it tomorrow night for Girl Scout Night versus the Hartford Wolfpack. There’s no giveaway, but remember the doors open at 5:30PM on Saturdays, so c’mon downtown a little early and watch some football before the game, if you want. We’ll have a “Hockey Night” post up at some point during the day–less detail with the back to back. Sunday will see the team head up the coast to Bridgeport to complete the 3/3; then they’ll be in Hershey a week from tonight.